First, it’s important to distinguish between different types of martial arts fitness. Before you choose a glove, you need to know what you’ll be doing. Here are some common fitness training activities that require gloves, so you can determine your glove needs. Some group fitness classes won’t focus solely on striking. 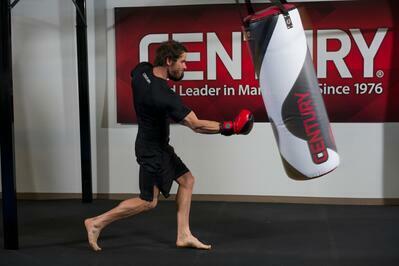 In between punches and kicks on a bag, you’ll do reps of other exercises. These can be bodyweight (squats, pull-ups) or lifts involving weights. Your gloves should allow you to transition between these things, or else you’ll constantly have to take them off and put them back on during the class. Look for gloves with a flexible wrist that will give you full mobility for lifting, push-ups, etc., and open palms and fingers, or thin, textured palms, so that you will have a secure grip. Cardio Kickboxing and Cardio Boxing are two examples of group fitness classes that are completely striking-oriented. Either open or closed palms/fingers will work. You may want to look for gloves with features that will help keep your hands in the right form for striking, such as an internal grip bar or attached thumbs. This will also help reduce hand fatigue. If you need more wrist support, wear hand wraps underneath. BONUS: Washable gloves like the Strive Washable Boxing Gloves are perfect for fitness classes, because you can throw them in the washer and dryer, with the rest of your gym clothes! You’ll have fresh, clean gloves each time. There are far fewer group fitness classes that emphasize this intense level of bag work than the previous two categories. Usually, individuals working out at this level (think: Rocky Balboa intensity) have already trained in a martial art and are honing their skills. The harder you hit a bag – especially a sand-filled hanging heavy bag—the greater the chance of hurting your wrist or fingers if you don’t use perfect form. If you do plan on training as a heavy-hitter, you’ll want gloves with sturdy wrists and a lot of padding, especially over the knuckles. If you’re going to participate in a group fitness class, the best thing you can do is ask your instructor what kind of gloves you need. He or she should be able to point you in the right direction. However, more knowledge when selecting your gear is never a bad thing. I hope this guide has provided you with some valuable insights.